To Youth Sunday or Not to Youth Sunday? It may sound surprising, but not all youth ministers get excited about the idea of Youth Sunday. In fact many youth leaders are so opposed that they won’t even do one. What could be so bad about putting youth in charge of a Sunday worship service and equipping them to take leadership roles typically occupied by adults? Well many would say that “every Sunday is youth Sunday,” and that the best practice is to fully integrate young people in the life and ministry of the church every week. That’s certainly hard to argue. So what to do? My home parish recently had a Youth Sunday service, and it renewed my faith in this much maligned staple of youth ministry. Let me tell you why I think it will have lasting impacts on our youth and our church. Our church just finished confirmation. And when the confirmands were asked what they wanted to do next, they all said they wanted to try a Youth Sunday service. But here’s where it gets good. They wanted to lead every part of the liturgy. Not just choose songs and do readings. They wanted to do the jobs we don’t typically give away. One young person wanted to be the priest! Another wanted to be deacon! They wanted to fill all the roles, not just a select few. And the best part is that our priest, deacon, and youth minister didn’t hesitate. They simply said yes. And then got busy figuring out how to support our youth and their desire to lead. The group decided it would work well to have adults serve alongside the youth. So any time a young person was leading, there was an adult standing nearby who normally performed that role. Not to monitor or supervise, but simply to support and encourage. The most powerful moment for me occurred when one of our teens said the absolution of sins. Normally, that’s when the priest pronounces to the congregation that our sins are forgiven after saying the confession. I’ve never heard a non-ordained person say those words in church. In that moment the priest speaks on God’s behalf, proclaiming one of the most important messages we receive in church, that we are forgiven. And this particular Sunday a thirteen year old girl was equipped, empowered, and entrusted to give that message. As she spoke the words, our priest stood beside her and made the sign of the cross over the congregation. I think our Youth Sunday sent some powerful messages. The experience told our young people, “You can do this. We trust you, and we need you.” I think it reminded our adult leaders that one of the most important things they do is to pass on, to transfer, and to train others for ministry. And I believe the entire congregation realized that our young people are the heart of who we are as a church. They are us, and we are them. Their potential is limitless, and all we have to do is believe in them, equip them, and get out of the way. The next step is to try and do it a little more each Sunday. I think we can. What if we just went to the hockey game? Last year our church’s confirmation class experienced a minor conflict that is probably all too familiar. One of the teenagers in the group was unable to attend the overnight confirmation retreat because he had an important hockey game. This of course posed the question of what to do. Reschedule the retreat? Press on without him and hope he could somehow “make up” the experience? Well, the priest, who happens to be my beautiful wife, had a simple and inspired idea. “What if we all just went to the hockey game?” After some discussion, everyone agreed it was the best option. And the entire confirmation class, adult mentors and all went to the hockey rink to watch the game. As you might imagine this was a very powerful experience for everyone involved. The young hockey player, felt loved and included. He practically had his own cheering section rooting him on. And his family felt the support too. Having the community gather to encourage and affirm their son communicated that their church was much larger than it’s own walls. Perhaps the best part of this story is that my brilliant wife didn’t miss the opportunity for some Christian formation. While the confirmation group sat in the stands watching the game, she asked them, “Where do you see God right now in this experience?” The young confirmands thought and began to share that they saw God in the cheers of the crowd, the teamwork on display, and the love of family members rooting on various players. And then one young man said something surprising. He said, “God is in the puck!” Everyone was slightly taken back, but when my wife asked him to say more, he explained that the puck wasn’t on anyone’s side and allowed everyone to play. God was right there at the center of everything. The saying “God is in the puck” became a mantra for the group for the rest of their time in confirmation. For me this story is emblematic of youth ministry in our present context. I hear so often that young people are busy, over scheduled, over programmed, etc. And it’s true. They are. I also hear the despair that families don’t make church a “priority” in the same way they used to and that “regular church attendance” isn’t so regular these days. Or the annoyance that certain sports have games and tournaments on Sundays, forcing families and young people to choose between participating in these activities or coming to church or youth group. These realities leave many churches and leaders feeling perplexed and discouraged about ministry with young people. They wonder what to do or what can even be done. I think this story points the way. What if we all just went to the hockey game? I think that not only would we show our young people in various activities that we love and support them. I think we would also find that God is right there in the middle of it all, inviting us to a community even larger and more powerful than we thought it could be. This isn’t bad, but this kind of invitation just doesn’t compel us. We’re probably more likely to file the information away for further reference than we are to act. Why is that? Let’s try it a different way and see if we can improve. How about this? I think most of us find this more inviting. And that makes sense because “you should go” isn’t really an invitation. It’s more of a suggestion. On the other hand “do you want to go with me” sounds so much more attractive. It’s wrapped up with relationship, connection, and safety. And it doesn’t hurt that our friend “went last year.” First hand experience always feels more reliable. 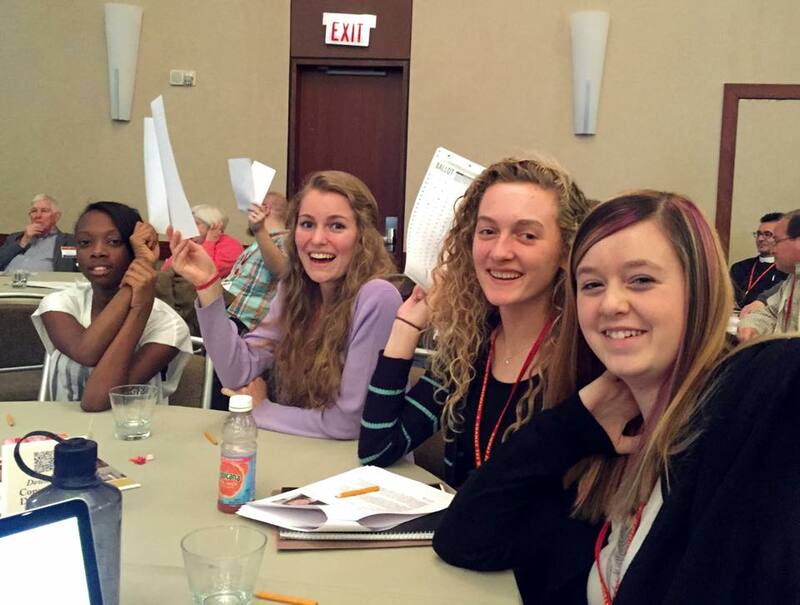 I think a great place for adults to start would be attending a diocesan youth event as a chaperone or volunteer. Or even make arrangements to visit for part of an event. The fact that you’ve “already been” will lend credibility and probably add excitement to the invitation. But even if you’re not able to visit an event before telling youth about it, the second part is still what is crucial. Do you want to come with me? Wouldn’t we all rather go into a new situation with someone we know rather than by ourselves? This week I’m attending the Forma conference in Houston for those who work in Christian formation. A running theme so far has been the importance of tending our own faith and being formed ourselves before we attempt to help anyone else on their faith journey. I think this is very wise, and I’ve believed for some time that “You can’t give away what you don’t have” when you’re in ministry. Earlier in the week, I was also blessed to attend the pre-conference at Camp Allen in Navasota. 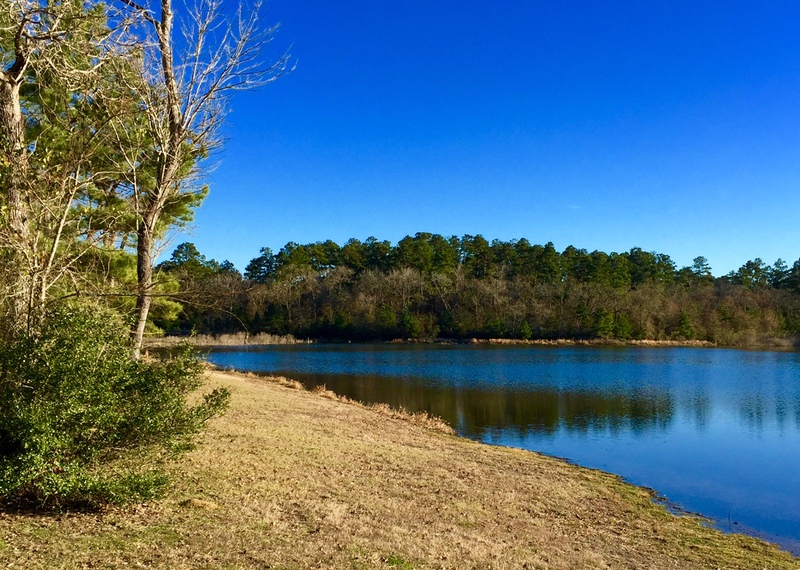 I had time to walk around the property and enjoy some solitude by the lake. I grew up in Texas and found myself somewhat overcome by memory. I spent a good deal of time reflecting, meditating and praying to try and hear what all these memories were trying to say. I wound up writing a poem about it. I offer it here and hope it can encourage others to pray and listen for God’s still, small voice, that speaks love into our hearts; healing, life-giving, redeeming love that makes it possible for us to love others and invite them to experience God’s love. Mae along with eleven other youth delegates joined the 700 leaders from our diocese that attended this important annual event to learn more about sharing our stories, welcoming strangers, and getting outside the doors of our churches to share God’s love. She represented her peers to vote on important issues facing the mission and ministry of the 127 churches in our diocese. All of our youth delegates made a significant impact through their presence and leadership. And it would seem that the experience left an imprint on them as well. Let’s keep this in mind and remember to include young people in leadership whenever and wherever we can in the life of the church. For years I’ve been fascinated by the US Navy SEALs. Undoubtedly, most are familiar with this elite group of warriors and some of their high profile missions. But you’re probably already asking “What could these gun toting commandos possibly have to do with youth ministry?” Hang with me. Any investigation of the Navy SEALs will uncover the intense focus this group places on teamwork, training, and excellence under pressure. Navy SEAL units are very intentionally called “Teams” rather than squads or platoons. And their training places utmost importance on each soldier working for the good of the team rather than the individual. One training exercise called “gear soup” puts all of the team’s gear in a small pool. Disorganized, scattered, and soaking wet, all soldiers have to retrieve their gear and prepare for their team’s mission under a time limit. Soldiers who look for their own gear first wind up doing extra PT to remind them to work for the good of the team. Perhaps one of the most impressive things about the SEALs is their ongoing dedication to training. In fact they would say that a SEAL never stops training. This is notable considering how difficult it is to become a SEAL in the first place. But even after a SEAL earns their Trident pin, they continue training throughout their career, adding skills and competencies. Not to mention continued physical training to keep their bodies in top condition. SEALs are incredible examples of lifelong learners. And this comes from their teamwork ethic. They constantly want to improve so they can be a better asset to the team! The best known trait of the SEALs may be the way they are expected to perform in extreme circumstances. 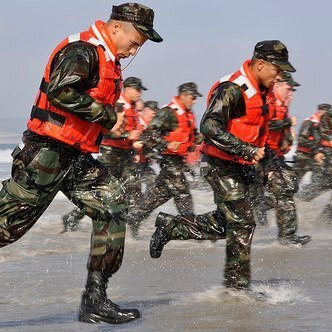 During training SEAL candidates are constantly ordered to get “wet and sandy,” which involves a long run across a beach, a quick dip in cold ocean water, a roll in the sand, and a long run back to formation. The soldiers complete the rest of the day’s training “wet and sandy.” The reason being that the instructors want the soldiers to learn how to perform at their best even when they are uncomfortable. I think all three of these traits are applicable to youth ministry. What do you think? How can we be more committed to teamwork, training, and excellence in our ministries with young people? It was near the end of a long committee meeting, and we were discussing the necessity of an overnight “staff lock-in” that would occur in preparation for an upcoming event. As I pressed the group of youth and adults to name the purpose for what felt like an “extra” event in a very packed calendar, one young member of the group raised his hand. He said with a smile, “Because it’s fun. Does it have to be more than that?” We decided to keep the staff lock-in for a variety of reasons, but this comment has stuck with me. I confess that I had allowed the thought of the event to become “work.” It felt like one more thing “to do” on a long list. Maybe you can relate. But this young man’s comment reminded me that the issue wasn’t purpose as much as perspective. To him this event was an opportunity to be with people he enjoyed, to share stories, and to laugh. Yes, there would be “God stuff” and “tasks” to complete. But his priority was relationship, friendship, and community. While I had allowed mine to become efficiency. I experienced this again last weekend at our annual Diocesan Convention. At the end of our first day of workshops, worship, speakers, and business sessions, there is a banquet followed by a dance. And when I say dance, I mean a DANCE. This is not the awkward moment at the wedding when everyone is waiting for someone else to dance. Everyone is on the dance floor having a good time. Last year I was really too tired to dance and went up to my hotel room after the banquet. I know. Lame. But thankfully, this year I was out there cutting it up with that beautifully diverse group of dancers. 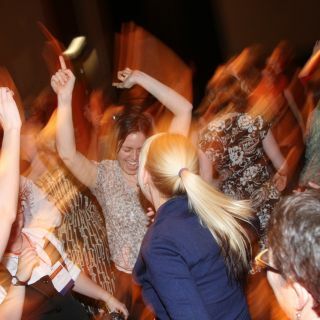 I heard another delegate say the next day how much he loved that our diocese “danced the night away” after a long day of business. I couldn’t agree more. It was fun. I felt closer to my companions in ministry, and I felt free to be myself. “Because it’s fun” is a great reason to do something when it helps develop meaningful relationships and forms deep community.